The National Incubation Center (NIC) hosted a session on “Do’s and Don’ts of Starting a Business” delivered by America’s best- selling author, columnist, Rhett Power. The session is part of the “Entrepreneurship” speaker series in Pakistan, at the NIC, in partnership with the US Embassy. 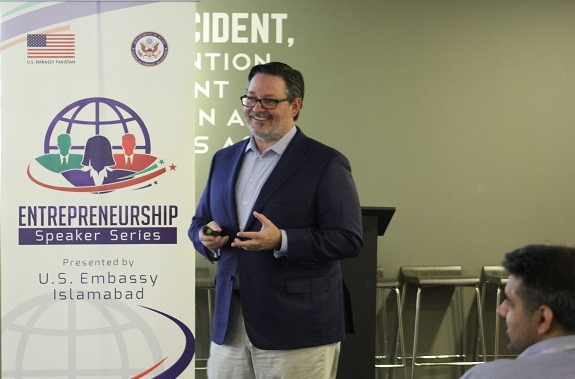 NIC Hosts “Entrepreneurship” Speaker Series in Partnership with US Embassy. In the session, Rhett Power talked about various elements on becoming a successful entrepreneur, the challenges entrepreneurs struggle with and how to grow as a sustainable business. During his presentation, he also shared his experiences with the startups on how developing a business strategy is essential for being a successful entrepreneur. The session created an opportunity for the startups at the NIC to connect with the presenter, exchanging thoughts and ideas as well as their experiences of running their startups. Said Project Director, NIC, Parvez Abbasi. Mr. Abbasi is also the co-founder of TeamUp, managing partner with Jazz xlr8 for the National Incubation Center.